From the publisher of Pride and Prejudice and Zombies comes a new tale of romance, heartbreak, and tentacled mayhem. 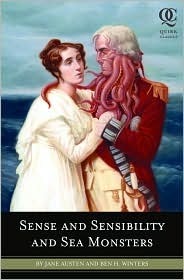 Sense and Sensibility and Sea Monsters expands the original text of the beloved Jane Austen novel with all-new scenes of giant lobsters, rampaging octopodes, two-headed sea serpents, and other biological monstrosities. This masterful portrait of Regency England blends Jane Austen’s biting social commentary with ultraviolent depictions of sea monsters biting. It’s survival of the fittest—and only the swiftest swimmers will find true love! Misty, thanks for hosting such a slew of wonerful giveaway events - I had no idea until I read about it at Velvets!